(Synopsis) It's Ella's senior year of high school and she and her best friend Linds plan to make it the best year ever. At Brock Cochran's end of summer pool party, the girls vow to have as much fun as possible before they head off to different colleges next fall. But when Ella is mysteriously attacked on her way home from the party, everything changes. Ella's carefree senior year plans disintegrate as she finds herself at the center of an attempted murder investigation. Ella tries to move on, but her attacker isn't done yet. He shows himself in the form of horrifying signs and symbols: a clown mask strewn on her bed, a dead bird in her backpack, a shadow moving past her window in the night. And as the weeks pass, it turns out that Ella isn't the only one being tormented. With the help of an old flame, Jensen Carver, and her friends and family, Ella tries to attain some sense of normalcy, but she can't seem to shake the feeling that there's a dark pattern hidden in the killer's every move. Suddenly, even those in her innermost circle seem suspicious. In her seemingly safe West Virginia town, Ella starts to wonder who she can trust. Suspense and horror lovers - have I got a book for you. The Dead List is all that and more. Originally released on Wattpad last year a few chapters at a time, it's now coming out for the first time in paperback, and if you haven't yet experienced how well Jennifer Armentrout can make you afraid, now is the perfect time to do it. I didn't read The Dead List when it first came out. I'm glad now for that. I don't know how anyone could read just a few chapters at a time, and then wait to see what happened next. This is a book that catches you up in the backstory and the twists and turns and, yes, the romance, so that you don't have a prayer of putting it down until you know EVERYTHING. Seventeen-year-old Ella was once best friends with Jensen before a tragedy rocked their young world and they grew apart. Now, they're reconnecting over the fact that some lunatic in a clown suit tried to kill Ella a few nights before her senior year starts. It soon becomes clear that she's still not safe, and Jensen vows to protect her until the killer is caught. 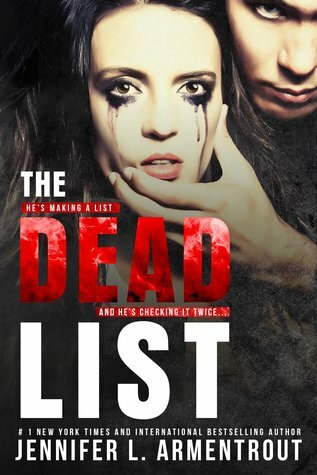 The Dead List was a perfect blend of horror, suspense and romance. Nothing seemed forced or unbalanced. The main point of the story is the killer in the clown suit and what he may or may not have to do with the events that drove Ella and Jensen apart four years earlier. That remains the driving force through the entire book. The side stories of Ella's former relationship with Gavin and her current relationship with Jensen don't cause you to lose focus, but rather give you moments to take a breath before the suspense and terror pick up again. I always need at least a little romance in my books, and Ella's budding relationship with Jensen gave me butterflies. Jensen was heroic and romantic and utterly perfect. I loved them together. "I want to be that guy - the one that when your phone rings, you hope it's me. The one who holds your hand in the hallway and at lunch. The guy who gets to hold you. I want to be the one who gets to touch you," he whispered against my cheek. "I want to be yours." To say there were twists, turns and questions everywhere is a gross understatement. I thought I had it all figured out through most of the book, but in the end I was blindsided, which I absolutely loved. 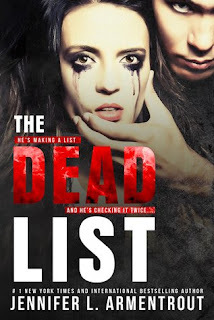 The Dead List is another winner from Jennifer Armentrout, but you might not want to read it late at night when you're home alone.